Wanted to have some sort of "homepage with my fav stuff, arranged as I want to" in firefox for a while, and finally got resolve to do something about it - just finished a (first version of) script to generate the thing - firefox-homepage-generator. Default "grid of page screenshots" never worked for me, and while there are other projects that do other layouts for different stuff, they just aren't flexible enough to do whatever horrible thing I want. In this particular case, I wanted to experiment with chaotic tag cloud of bookmarks (so they won't ever be in the same place), relations graph for these tags and random picks for "links to read" from backlog. "Mark of Chaos" button in the corner can fly/re-pack tags around. Clicking tag shows bookmarks tagged as such and fades all other tags out in proportion to how they're related to the clicked one (i.e. how many links share the tag with others). Started using FF bookmarks again in a meaningful way only recently, so not much stuff there yet, but it does seem to help a lot, especially with these handy awesome bar tricks. 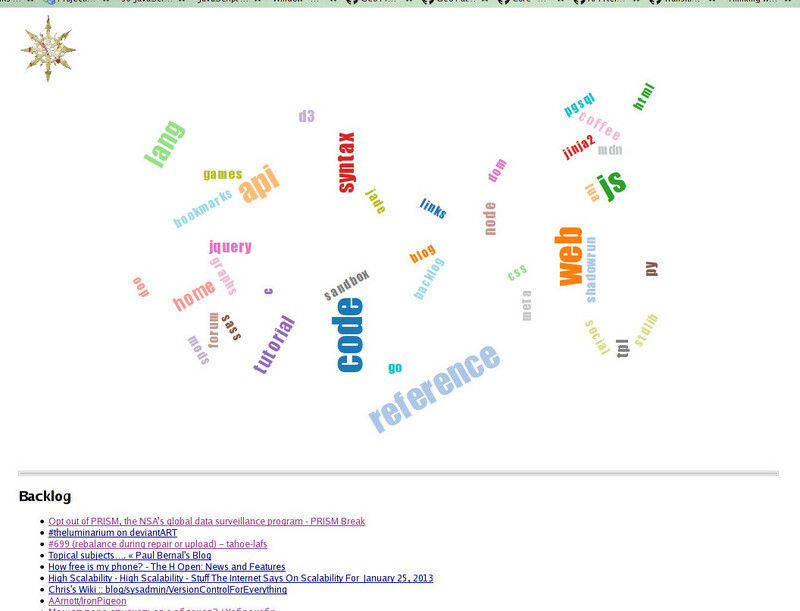 Not entirely sure how useful the cloud visualization or actually having a homepage would be, but it's a fun experiment and a nice place to collect any useful web-surfing-related stuff I might think of in the future.